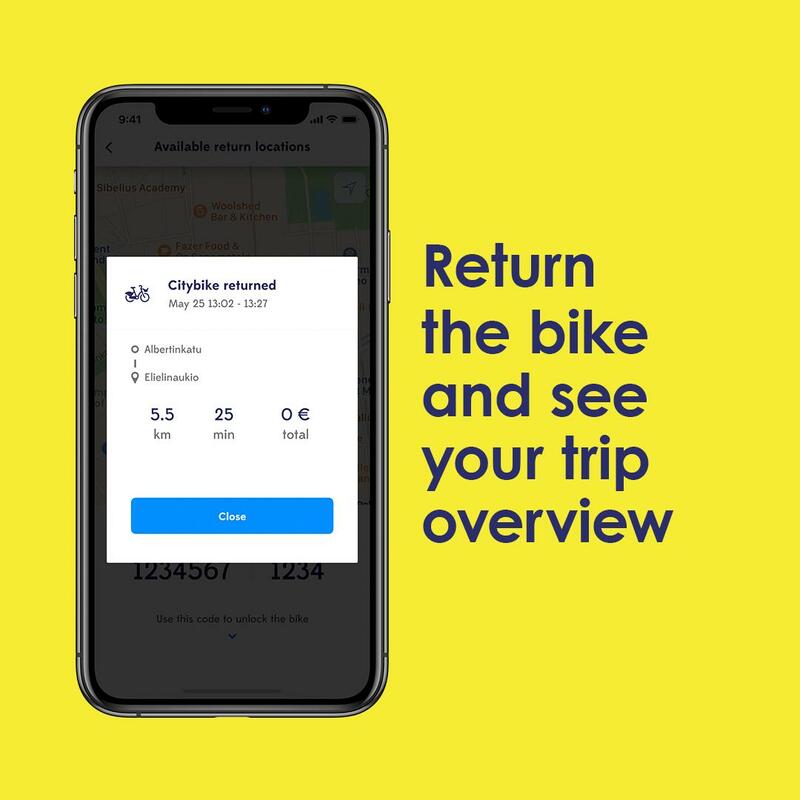 A 30-day HSL ticket, unlimited 30-minute trips with city bikes, unprecedented fl exibility and comfort of €10 taxis, and affordable rental cars. On top of this, a smooth transition into the new HSL zones. Subscribe by 26.04.2019 to enjoy the reduced price for the first 30 days. Whim Urban 30 includes a 30-day HSL ticket on your mobile phone. You don’t need a separate travel card, or to buy individual tickets. If you’ve got a valid Whim Urban 30 plan and your mobile with you, you’re good. Whim Urban 30 is valid on the same public transport services as your familiar HSL ticket: buses, Metro, ferry, and commuter trains in the HSL area. To use Whim Urban 30, you will need to be eligible for an HSL 30-day ticket. Are you worried about the HSL zone renewal? Worry no more, Whim Urban 30 has got you covered. Prices below are valid until the HSL zone renewal on 27.04.2019. Read more about pricing, HSL’s 30-day ticket eligibility, and the HSL zone renewal in our FAQ below. 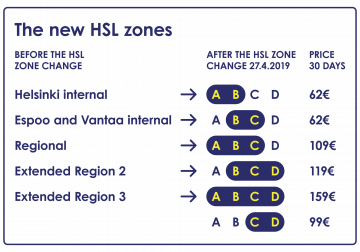 HSL zone renewal is taking place 27.04.2019, and we are securing a smooth transition for all our Whim subscribers. Your current HSL ticket will automatically be updated into the corresponding HSL zone. Whim gives you the freedom to choose – you can decide which zone ticket option is best for you. And, if necessary, you can change the HSL zone for your Whim Urban 30 plan after the zone change from 27.4. onwards. 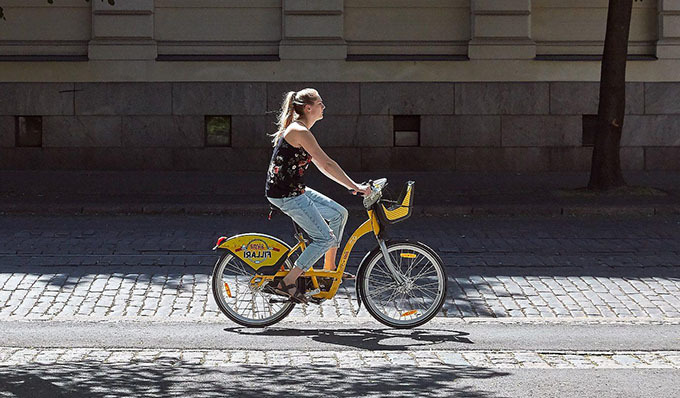 With Whim Urban 30, you can use city bikes in the Helsinki and Espoo region any time you like for up to 30 minutes per ride. You can see stations and available bikes on the Whim map; just find a bike station, and use your personal code to unlock the bikes. You can travel by taxi and no matter what the meter shows, you pay a maximum of €10 as long as your journey doesn’t exceed 5 km. 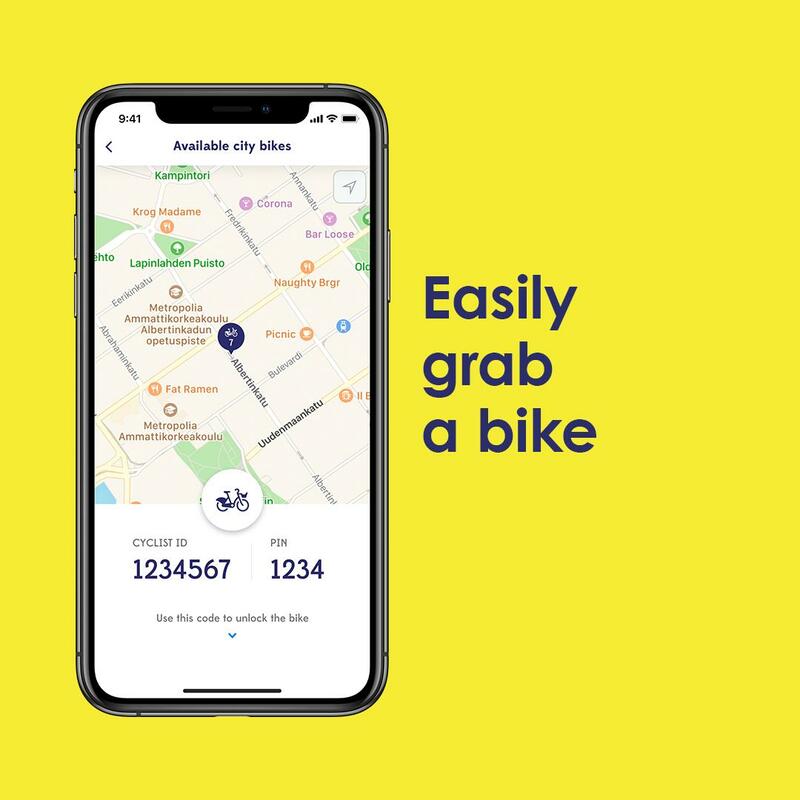 From what we’ve calculated, most people in and around the capital live less than 5 km from a convenient public transport route, so this is a smooth way to connect over longer commutes and leave your car behind. Naturally, we want to make sure you get to your meetings on time or have a safe journey home after an evening out at a restaurant. 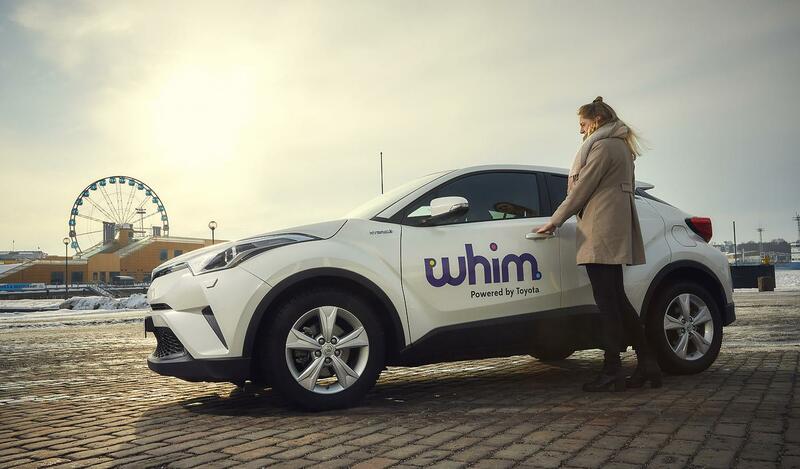 If you only occasionally need a car of your own – the odd visit to a summer cottage or shopping center – Whim Urban 30 offers the simplest way of renting one. 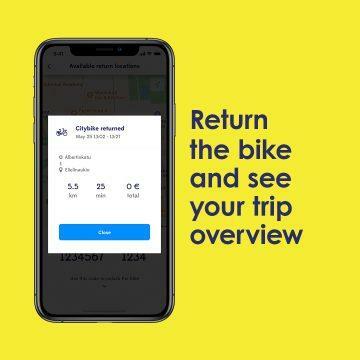 Using the app, you can hire a car (a Ford Fiesta or equivalent) with no need to trawl endlessly through car rental sites. With Whim Urban 30 a day’s rental is just €49. Best of all, the deal even includes unlimited kilometres. Your subscription is automatically renewed after 30 days, so you don’t need to remember to renew it yourself. 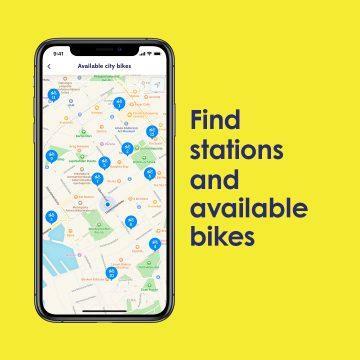 This year, starting from the beginning of April, there will be 3,430 city bikes ready to ride at 238 stations. Am I eligible for the 30-day HSL ticket / Whim Urban 30? 1. 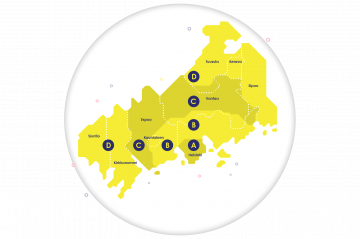 Your permanent address must be in one of the HSL municipalities: Helsinki, Espoo, Kauniainen, Vantaa, Kerava, Sipoo, Tuusula, Kirkkonummi, or Siuntio. 2. When purchasing the Whim Urban 30 plan, which includes the HSL 30-day ticket, you will need to authenticate – either with bank credentials or mobile certificate. This will also verify your city of residence. 3. To authenticate, you’ll need to log in with your HSL account. The purchase process will direct you to the HSL service automatically, where you’ll either need to log in to your existing HSL account or create a new one. 4. 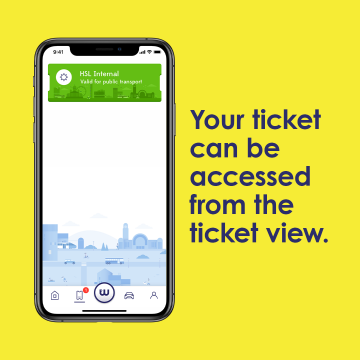 It is not possible to have an active season ticket on an HSL travel card or in the HSL app. If you do, simply use your existing ticket until it runs out, and then activate the 30-day ticket through Whim. You cannot transfer existing time from a card or the HSL app to Whim. If you have loaded an HSL travel card with value – as opposed to time – this will not prevent you from getting the 30-day ticket through Whim, and it won’t affect the value on your card. Why are the prices changing after the HSL zone change on 27.4.19? 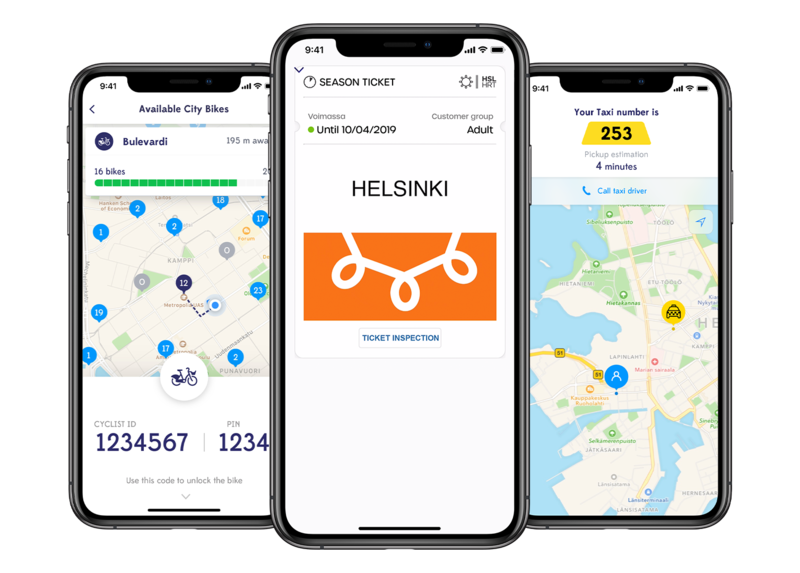 Public transportation prices will change in the Helsinki Metropolitan area with the new HSL zone change on 27.04.2019. So, are you still getting value for your money? 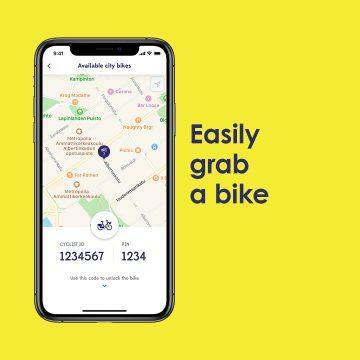 The Whim Urban 30 prices will reflect the new HSL pricing for the 30-day HSL ticket, and for an additional 0.08€ per day you get unlimited 30 minute city bike rides, 10€ taxis, and affordable rental cars. Whim Urban 30 is the best plan to move around, across and beyond the zones! 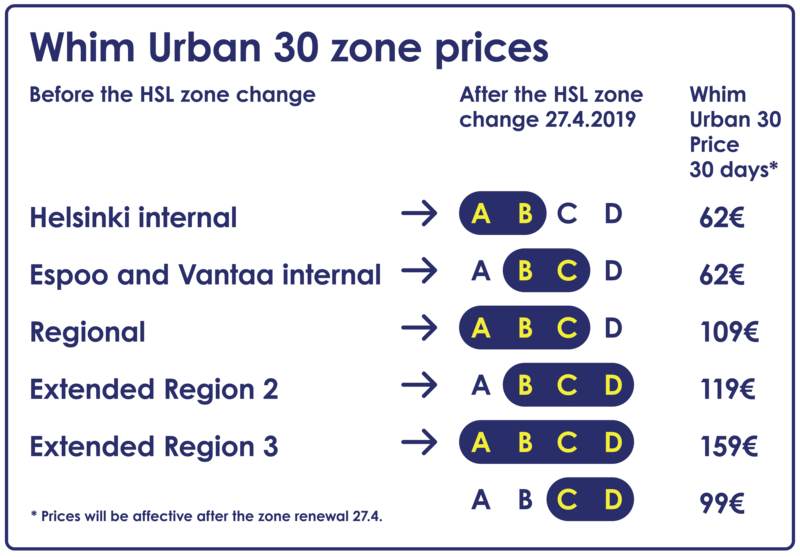 See our updated Urban 30 price list per HSL zone below. 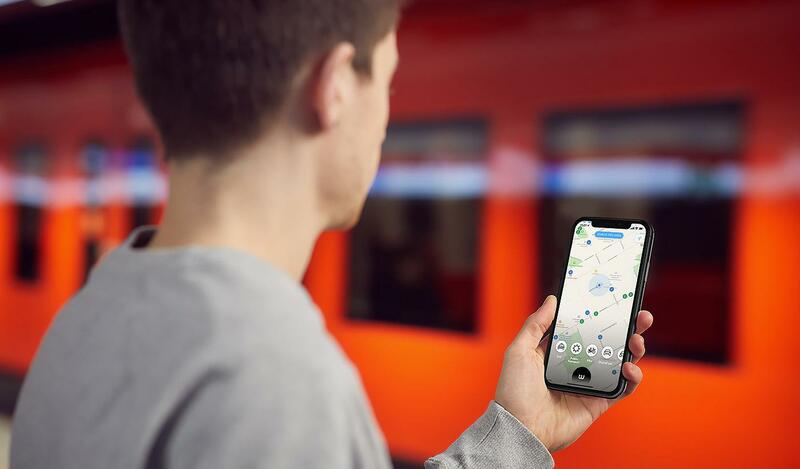 HSL zone renewal is taking place on 27.04.2019, and we are securing a smooth transition for all our Whim subscribers. Your current HSL ticket will automatically be updated into the corresponding HSL zone. Whim gives you the freedom to choose – you can decide which zone ticket option is best for you. And, if necessary, you can change the HSL zone for your Whim Urban 30 plan after the zone change from 27.4. onwards. Simply write us a message via the in-app Help center and we’ll do the rest for you. 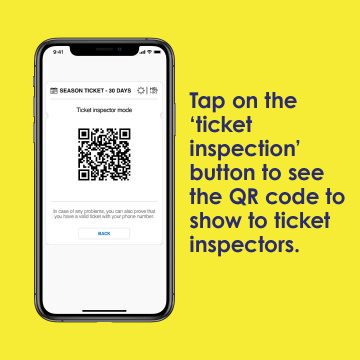 How do I show my 30-day HSL ticket to ticket inspectors? 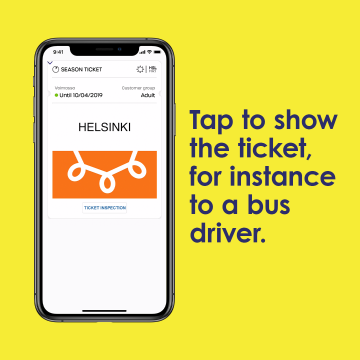 Whim Urban 30 is valid on the same public transport services as your familiar HSL ticket: buses, Metro, ferry, and commuter trains in the HSL area. How do I change the old Whim Urban to the new Whim Urban 30? Whim Urban 30 will replace current Whim Urban plan. Please update your current Whim Urban plan immediately as the current Whim Urban plan will stop working April 26th 2019. No worries if you still have a days left in your plan, you can upgrade to the new Whim Urban 30 plan right away. The unused days from your old Whim Urban plan will be transferred over and you will only be charged for the difference between old and new price. This happens automatically at the final stage of the checkout. 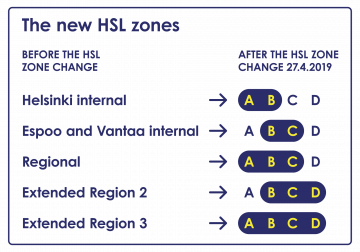 You can of course decide which of the new HSL zones is best for you. If you wish, you can change the zone in the profile view after the HSL zone reform from 27.4. onwards. The new zone you select will take effect at the start of the next 30-day subscription period. If on 27.4, you have been transferred to a zone subscription that has too much coverage (for example, your HSL regional ticket changed to ABC but you actually only need AB), the amount of unused travel dates will be credited to you as a Whim travel credit. The refund is not automatic, so please contact our customer service directly through the application (profile> customer service> contact). This is possible after the HSL zone change on 27.4 until the start of your next 30-day subscription period. 1. Update the latest version of Whim from the App Store or Google Play. 4. Give MaaS Global / Whim the authorization to handle things for you and log in or register to HSL account. 7. You’re ready to use your new plan. The 30-day HSL ticket will renew automatically with the renewal of your plan. *Authentication with HSL account is needed so that HSL can verify your home municipality. This process only takes a few minutes. Happy traveling with Whim Urban 30!